Kildare Nationalist — McGregor get on his bike! » McGregor get on his bike! McGregor get on his bike! FORMER UFC two-weight champion Conor McGregor paid a visit to Naas on Tuesday to purchase a mountain bike from a local store. 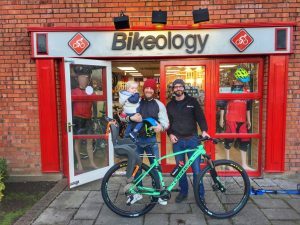 He made a surprise visit to Bikeology on Monread Avenue to buy a green Orbea mountain bike, fitted with a child seat. McGregor brought his young son Conor jnr along for the visit. “He was an absolute gentleman. He just came in and bought the bike and that was it,” said Ross Pearson of Bikeology. McGregor must have turned to a different mode of transport following a six month drivng ban at Naas district court last November. He received the ban and a €1,000 fine after being clocked driving at a speed of 154kph in a 100kph zone. Bikeology posted a snap of a happy McGregor and his purchase outside the shop on Instagram. “Best of luck with your new bike @thenotoriousmma,” said the post. We got a great response. It’s snowing, no one is buying anything, so it was great,” added Mr Pearson.